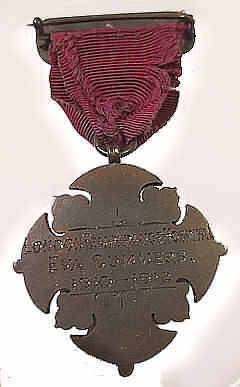 Above: Eva’s (brass) London Temperance Hospital badge. number of soldiers being repatriated home requiring hospitalisation. Eva applied to the Territorial Force Nursing Service in February 1917. In her reference by the home matron, where she had worked as a sister for over two years Eva was described rather unfortunately as ‘...plodding and not brilliant...’, although the rest of it was positive, and described her as ‘…kind and attentive…(4) Consequently Eva was appointed as a Staff Nurse in the T.F.N.S. at the 4th London General Hospital, which was based in the Maudsley Hospital, Denmark Hill. From 1915 it had a neurological department and was the clearing Hospital for these casualties of war. (5) By her demobilisation she had been promoted to sister. Eva was demobbed in 1919 with a glowing reference …'has a good professional ability and is a very capable and sensible person. She is particularly tactful in dealing with difficult patients and is very kind and attentive to the patients'. (6) Working with soldiers who had been maimed by war and many with neurological injuries must have taken great nursing skill and professionalism. In 1920 Eva communicated with the T.F.N.S. management about her reference which had unfortunately been despatched to her with the wrong name on. In June 1923 the Joint Nursing and V.A.D. Services Committee wrote to Dame Maud McCarthy, Matron–in–Chief of the TANS to say that Eva, who had been suffering from cancer for some …'considerable'… time had died, aged 45 years. (7) The committee had been allowing her a grant of £2 per week up until her death and decided to show compassion and allow her mother to keep Eva’s T.F.N.S. 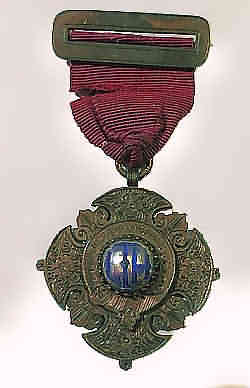 medal. (8) Her mother appears to have died that autumn following Eva’s death. Above: variations of the hospital nurses badge. All the above images copyright www.schoolsofnursing.co.uk. 1. www.ancestry.co.uk, accessed 1January 2016. 2. Nursing records for 1892-1948 are held by University College NHS Trust. 3.The National Archives, WO399/14818,Eva Summers accessed 1 January 2016. 4.The National Archives, WO399/14818,Eva Summers, form II, accessed 1 January 2016. 5. http://www.1914-1918.net/hospitals_uk.htm, accessed 1 January 2016. 6. The National Archives, WO399/14818,Eva Summers, accessed 1 January 2016. 7. The National Archives, WO399/14818,Eva Summers, June 29.1923, accessed 1 January 2016. 8. The TFNS were usually very strict about the return of medals to them.